I've been working on this one for a while... a Dual Sequential Switch for Buchla format. Primarily it's intended as a companion for the 245/246 sequencers, extending their range from 5 to 20 or 16 to 64 steps respectively. The jacks for the Stage Select inputs and Active channel outputs are borrowed from the 245/246 paradigm as well. 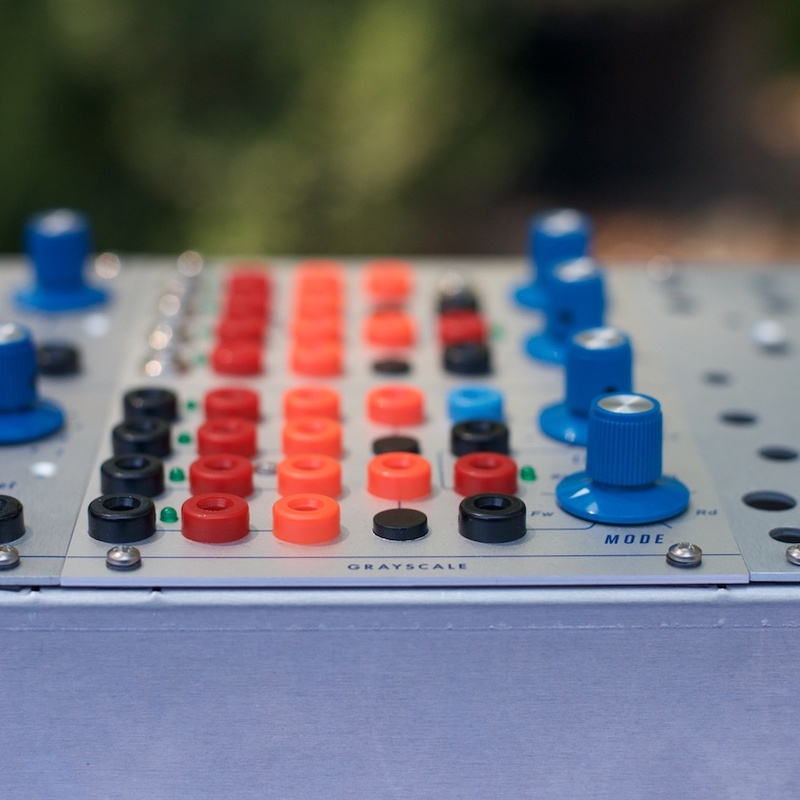 Of course the 4-way setup also pairs nicely with the many other "quad" modules in the Buchla world such as the 281 and 292. The main I/O is bidirectional, meaning that the module works as a 4:1 multiplexer or a 1:4 demultiplexer. CV control over Length and Mode is provided (scaled to a 0-10V range, although negative voltages are also supported if you want to subtract instead of add to a value). The "L.BND" output is for Length Boundary... a pulse is generated whenever the length changes (whether manually or via external CV). Cross-patching the top and bottom sections together also creates a lot of possibilities for complex rhythmic interaction. The module can be built with your choice of bananas or Tinijax on either or both sections (not just bananas as shown in the illustration above). The main I/O circuitry is designed to handle both AC and DC signals, it's just a question of installing one type of jacks or the other. Retail price is going to be in the $400-500 range, hoping to be shipping these in September. Assembled only, no DIY option. Please comment here or send a PM with your name, email address, and location if you want to get on the waiting list for the first batch. Here's a photo of the prototype. Tinijax on top, bananas on bottom. Final panel will be brushed and silkscreened, fabricated by the same shop that DIY Hub (200r panel provider) uses. The work is great, too! Looks nice! You may want to consider this exchange of jack and button in the upper half of each unit. Freeing the manual buttons from being boxed in when patched. Thanks. In the MI conversion thread someone mentioned the "Buchla tax" – doing Buchla stuff is more expensive than Eurorack due to the larger PCBs and panels, certain more expensive components like Tinijax, and also due to the time involved in wiring all the jacks (it's a lot more work than soldering a bunch of 3.5mm jacks directly into a PCB). But I'll try to keep things reasonably priced. There actually was a design iteration like that early in the process, but I couldn't "unsee" the two adjacent jacks being interpreted as Reset inputs. Consistently having labels above all of the jacks make this more clear IMO. In actual usage the Trig button is easy to reach, even when patched all around. Sure, thanks a lot – will PM you for details. There actually was a design iteration like that early in the process, but I couldn't "unsee" the two adjacent jacks being interpreted as Reset inputs. Consistently having labels above all of the jacks make this more clear IMO. yes. I noticed that also, and made an update. In actual usage the Trig button is easy to reach, even when patched all around. Glad you find it works for you. 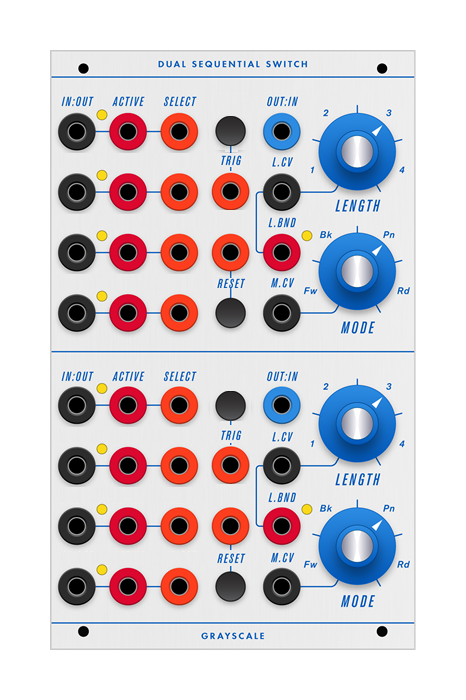 Buchla patches get dense and for me it will be better outside the corral. Either way, still a nice module idea and realization! Just fine-tuning the calibration procedure on this one, hope to post some demos soon. Its nice to see new life being breathed into the format - and as with the prime example of the Pendulum/Ratchet - not just any old function but things with a Buchlidian flavour. Took me a bit of time, but I think I'm starting to wrap my head around it. Can this be used as a sample and hold? So, as a 1in4out - would the output hold the last value sent to it, until it was selected again? Think of it as a room with four entrances and one exit (4:1) or one entrance and four exits (1:4). There's no real difference between entrances and exits, it just depends on which direction you are moving. And only one of the four doors (whether entrances or exits) can be open at any given time. You are sort of describing a shift register (like the SynthTech E102) but the 1:4 setup is about routing a single input to one of four outputs, not holding a voltage at its current value until changed. Different concept. The I/O could also be patched with audio, not CV, so it's not really about holding on to CV signals. It's about opening and closing one of the four doors so that you control the signal flow. Yep yep, I get you. Like, if I have a fluctuating random source as an input, and four oscillators as outputs, only the currently selected oscillator will fluctuate randomly. So do the other three maintain their last value, or drop to 0V? Is there a logic behind why they do either? Right, the fluctuating CV would only go to one of four oscillators. Or going in the other direction, you could have four different envelopes patched to the four inputs and route them to a single VCA. Inactive channels are completely disconnected, otherwise there would be undesirable summing or mixing and whatever signal is passing through the module would be transformed. The reason the channels don't maintain their last value is because that would be a totally different type of module (shift register). There are 1:4 shift registers and 1:4 sequential switches but that's where the similarity ends, the circuitry and concepts are not the same. Got some bad news on this one, the microcontroller is backordered until October at the earliest! Something to do with Microchip/ATMEL retooling their production line as part of the merger. So it goes. Still need to do a little testing anyway, just wanted to post an update. Apart from a calibration procedure bug and a few resistor tweaks, it's otherwise working well. How is this looking these days, sempervirent? Thanks for asking. It's somewhat of a lower priority than the Buchla-format Clouds, Rings, etc modules but it's still in the queue. It's pretty close to being done, just needs a few firmware and resistor value tweaks. Cool. I just want to make sure builders like you know you have our support. Add me to the waiting list too--thanks! Thanks, really appreciate that. I'll keep this thread updated as things evolve. 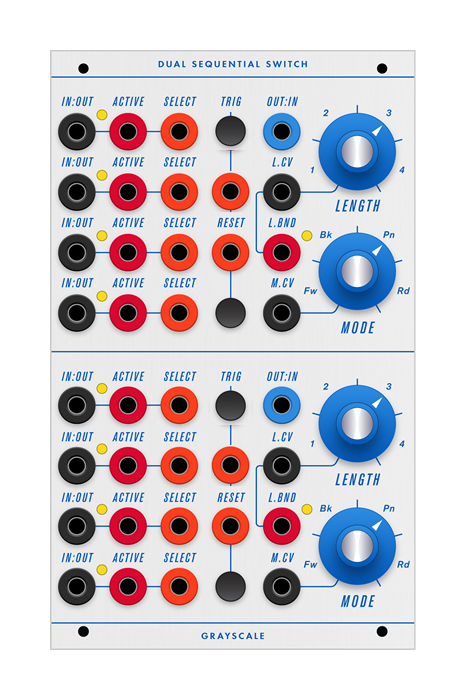 Still keeping my eyes open for that Sequential Switch module. The cv control is a great feature! Yep. There will be a space next to my 245 waiting for this one! Thanks guys. Just looked back at my first post. Shipping in September – ha! Haven't forgotten about this one, will post details here once it's ready for release. make the 245 and 266e go crazy.